William Arthur Smith Benson (born October 17, 1854 in Paddington, Middlesex and died on July the 5th, 1924 in Manorbier, Pembrokeshire) was an English artisan and designer. Benson was a founding member of the Guild of Craftsmen in 1884. W.A.S. Benson, was the oldest son of William Benson (1816-1887), lawyer in Lincoln's Inn, and his wife, Elizabeth Soulsby, daughter of Thomas Smith of Colebrook Park (Tonbridge, Kent). He had two sisters and three brothers: Francis Robert Benson, actor, and Godfrey Rathbone Benson, first Baron Charnwood. William was the least able-bodied among his siblings. From young Benson, who grew up in a comfortable house in Winchester, Hampshire, he was expected to follow in the footsteps of his father and become a lawyer. He liked to stay with his uncle, William Arthur Smith, who led the boy to the machine and the foundations of mechanics. First, William attended the Darch's Preparatory School in Brighton, Sussex, and then Winchester College. In 1874 he entered New College, Oxford, where Benson studied Classical Philology and Philosophy. He fought his way through to completion, but then decided to go to the London office of architecture, Basil Champneys because he thought he could combine his interests in art and mechanics with an education in architecture. He remained in Champney's office at Queen Square until 1880, but soon realized that he wanted to work with his hands. 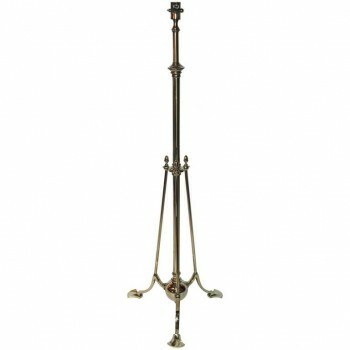 William Benson, floor lamp, gilt bronze and lacquer, circa 1900, England. Measures: Height 145 cm, diameter 30 cm.